HOUSTON–A barrel of crude oil has the equivalent Btu heating capacity of 6 Mcf of natural gas, yet a barrel of oil was priced 25 times higher than an Mcf of gas on the New York Mercantile Exchange in late April. This widening valuation gap between oil and gas is leading many North American operators to rebalance their portfolios toward liquids reserves, and is driving new investment opportunities in unconventional plays with oil and natural gas liquids. The strategic shift to liquids includes high NGL-yield gas shales such as parts of the Marcellus, Eagle Ford and Woodford, as well as oil shales such as the Bakken, Niobrara, Avalon/Bone Spring and the northern part of the Eagle Ford. In addition, companies are targeting multiple-zone “tight” liquids plays, including the Granite Wash in the Texas-Oklahoma panhandle region and the Wolfberry in the Permian Basin. Although liquids plays use the same horizontal drilling and multistage hydraulic fracturing methods that opened gas shales from the Barnett to the Fayetteville and Haynesville, drilling and fracturing technologies are being both applied and evolved in a “fit for purpose” manner to target liquids reserves. No two shales are alike; they vary vertically and aerially, especially along a well bore perpendicular to the frac direction. Operators must understand differences in shale fabric, in-situ stresses and geologic characteristics within each play, and how the formation will react to various drilling and stimulation designs that change in situ stresses. The step-rate application of hydraulic pressure in shale formations during treatment creates complexity by opening and interconnecting natural fracture systems within the rock matrix. In shale plays, complexity is definitely a good thing, but it is not possible in some shales that do not have natural fractures or where stress differences between minimum and maximum horizontal directions are greater than about 5 percent. In contrast to a simple biwing planar fracture that is perpendicular to the least principle stress, hydraulic fracturing in ultralow-permeability shales with low stress differences links the well bore to primary and secondary natural fracture mechanisms, resulting in complex networks that provide sharply increased access to the reserves. Natural fracture systems dominate permeability in shales, with some formations more extensively fractured than others. Natural factures may be closed or even sealed by calcite, salt and clay, but they can be broken down at only 50-60 percent of the pressure that it would take to break rock that is not naturally fractured. This lower-pressure pathway development is critical to increased complexity, because achieving economic production rates from shale depends on opening fractures–and keeping them propped open– to provide an adequate stimulated reservoir volume and create conductive pathways for hydrocarbons to flow to the well. Opening more natural fractures increases the stimulated volume of rock surrounding the well bore and provides more reservoir access. A horizontal gas well with 10 frac stages is estimated to create as much as 100 million cubic feet of stimulated reservoir volume in “sweet spots” where there is significant natural fracturing. Fracturing complexity also contributes to both the high initial rates and the characteristic steep production declines seen in both gas and liquids shale plays. Horizontal gas wells can decline 80-85 percent during the first year of production. Oil is more viscous and depletes slower, but decline rates still are considerably higher than in conventional reservoirs. It is not unusual for “good” wells in the Bakken and Eagle Ford oil window to be making only 30-40 percent of their initial daily rates after one year of production, with most of the declines occurring in the first few months. Decline rates are a function of flush production from voids within the rock connected by natural fracturing (penetrating the voids yields the high initial rates), and how much rock volume has been effectively stimulated by hydraulic fracturing (accounting for much lower, but more stable rates after the voids have been drained). A related secondary problem is that quickly draining hydrocarbons trapped in the voids reduces reservoir pressure. Flattening decline rates and slowing pressure loss requires propping open as much of the natural fracture system as possible to better drain the stimulated reservoir volume after flush production. The development of fracture system complexity was first documented in the Barnett Shale. The discovery well–the C.W. Slay No. 1–was drilled in 1981, but it would be 17 years before the Barnett would become a commercial success. Mitchell Energy Corp. had used the same stimulation techniques developed in the Devonian Shale in the 1970s, and had first foam fractured and then gel fractured the well. However, the C.W. Slay did not produce economic rates until Mitchell Energy performed a third frac job using a large slick-water treatment pumped in steps to high injection rates. The reason was simple: A large-volume, high-rate slick-water frac was the missing element in getting the natural fractures to open. Gas shale drilling and completion has evolved into a highly efficient “manufacturing” process in a few shales after sufficient experience has been gained with a type of completion. Field development commonly consists of drilling horizontal laterals and pumping multistage slick-water fracs starting with a fine (100-mesh) proppant, usually sand. However, because liquid is more viscous than gas, it is more difficult to flow through long, narrow fractures in low-permeability rock. Therefore, in liquids plays the goal is to create shorter and wider fractures that do not develop as much complexity, but have higher conductivities. To control fracture length and enhance conductivity, more stages are pumped with more precise placement. Instead of 10 stages, a newer design for a liquids shale well might use 28 or more stages positioned to achieve short, highly-conductive fracs stacked along the entire length of the lateral. Higher-viscosity linear and cross-linked gels that will not leak down the natural fracture system, and higher-strength proppants produce wider fractures that will remain open at higher compressive strengths. To selectively position stages at the most favorable locations along the lateral, frac points are selected using hydrocarbon shows, formation brittleness and mineralogy data acquired during drilling. Essentially, the operator looks at the mud log to find oil shows and the sonic log to pick the most brittle areas. Hydrocarbon shows indicate areas with higher permeability through the matrix or where the well has intersected a natural fracture or cluster. Brittleness is important because the more ductile the shale, the more difficult it is to establish fracture flow capacity. Ideally, frac stages are placed at points where the mud log shows oil flowing during drilling and where the shale is most brittle, because that is potentially where voids exist for flush production and where hydraulic fracturing can best establish communication with the reservoir. There are distinct differences between dry gas and liquids shales that impact field development strategies, and different types of fracturing treatment designs are evolving to exploit liquids plays. There is no “one size fits all” solution, and each play has its own drilling and completion styles. In the Barnett liquids window, operators initially attempted to apply the same frac designs that had worked so well in the gas window. While wells produced commercial quantities of oil immediately after pumping frac jobs, they rapidly tailed off to subeconomic rates as the fractures closed. Recognizing the difficulties in achieving fracture height growth and carrying sufficient proppant into open fractures, operators have adopted a “W” pattern, where wells are landed alternatively high and low in the zone, and frac stages are spaced more densely to increase coverage throughout the zone. In contrast, the Middle Bakken is a limey silt stone rather than a shale, and has a higher permeability matrix. The key in this play appears to be maximizing well bore contact with the formation and any existing natural fractures to access more reservoir area. The obvious way to develop a larger fracture-to-formation contact area is increasing lateral length and the number of frac stages. Laterals have been extended to more than 9,000 feet with reportedly up to nearly 40 frac stages, and the industry is seeing better performing wells with lower decline rates. In both the Bakken and Granite Wash, where reservoir contact also is the main consideration, another level of technology may soon be added to field development: multilateral drilling. If the objective is to maximize contact area and fracture growth can be controlled with mechanical or purpose-built intelligent junctions, why not drill two laterals instead of one, perhaps in opposite directions? Bakken operators already are drilling short multilaterals from one vertical bore hole in a “bird’s foot” or “five finger” pattern. Fit-for-purpose fracturing systems eventually will be adapted to meet the needs of Bakken and Granite Wash multilaterals. The Eagle Ford oil window is different in that while it has a little higher permeability than other shales, it lacks widespread natural fracturing. As a result, fracture systems are more planar and less complex. Many Eagle Ford wells use “hybrid” fracs, where treatments combine slick water with linear or cross-linked gels to minimize leak off and increase fracture width (local stresses act to keep fractures narrow). The Eagle Ford oil play also requires stronger and larger propping agents, including resin-coated sands, ceramics and even intermediate-strength proppant systems that use nanoparticles. Interestingly, the oil recovery factors in both the Bakken and the Eagle Ford shales is about 1.5 percent of the initial oil in place. This is comparable to the initial estimates of 2 percent gas recovery in the Barnett that was driven to 20-30 percent by technology advances driven by applications learning. Similar technology advances will drive recovery in the Bakken and the Eagle Ford. On the other hand, the Wolfberry consists of the conventional Wolfcamp, Spraberry and Dean oil intervals, but like shales, it is challenged by low relative permeability issues. The recovery factor in these reservoirs historically has been less than 10 percent, and they are not good waterflood candidates. Production and recovery rates have improved significantly by linking the pay zones through horizontal/deviated drilling and performing multistage completions custom designed for each zone. There are as many as eight productive zones down to the Fusselman at +10,000 feet. Some zones require only acid washing, while others require high-rate gelled fracs and high-strength proppants. Most problems encountered in liquid shale plays are related to relative permeability issues caused by oil viscosity and the capillary trapping effects that limit the amount of liquid that can flow through low-permeability rocks, especially considering that many oil windows are at shallower depths with lower pressures. If I was looking for an oil shale play, I would search for a deeper reservoir that was borderline thermally mature with a vitrinite reflectivity between 0.9 (in the oil window for most kerogens) and 1.3 (in the wet gas window). Relative permeability issues can be mitigated with the right drilling and completion designs. The keys to success include better well placement, improved fracturing effectiveness and increased reserves recovery. In many formations, 3-D seismic is essential to identifying geological hazards as well as assisting in placing the well bore to maximize reservoir access (laterals are generally positioned transverse to the primary orientation of natural fractures). Integrating 3-D seismic with mud log, logging-while-drilling and mineralogy data optimizes placing laterals as well as hydraulic fracturing stages. It also is important to understand how to initiate, drive and stabilize the fracture system itself–whether opening primary or secondary natural fractures, or generating a planar fracture. The industry is acquiring that understanding through experience, but good petrophysics programs can provide short cuts and eliminate “trial and error” field experimentation. Managing stress regimes within the formation is extremely important. Several technologies are being incorporated into interpreting 3-D seismic and well logging data to delineate high stress areas with the greatest potential for natural fractures, modeling stress profile changes through the formation, and determining directional differences between the horizontal minimum and maximum stresses, which ultimately control where hydraulic fractures will go. Stress regime management is key in sequential and simultaneous fracturing techniques, which use real-time stress changes created by a frac treatment in an offset well to reroute fractures in adjacent wells to unstimulated parts of the formation. Slick water remains the dominant fracturing fluid, with several million gallons of water pumped per well in the Haynesville, Barnett, Marcellus, Bakken and Eagle Ford. Slick water’s low viscosity reduces polymer damage and increases penetration into microfractures intersecting the well bore. As treatment pressure is stepped up, the water invades the natural fractures and acts like a wedge to open the fractures and create even more area in which to penetrate. Because shales are undersaturated with water, they retain much of the frac water that enters natural fractures. This appears to be a positive in some shales because the water acts as a propping agent (it may not be the water itself that helps keep fractures propped, but minerals in the formation that swell or change shape in reaction to water). However, freshwater is not always the best choice. Higher-viscosity gelled systems are better suited to liquids plays to achieve the wider fracs and controlled lengths to accommodate oil and condensate flows. There also is considerable environmental push back to using freshwater in hydraulic fracturing. Although the industry routinely recycles water flowed back after fracturing, only 30-50 percent of the total water pumped during treatment typically is produced. The majority is absorbed by the shale. One solution is to use saltwater from high-salinity zones that are unsuitable for human or agriculture use. 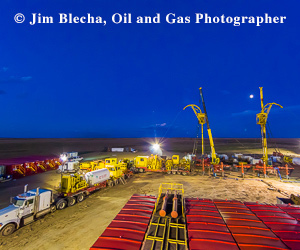 In the Horn River gas shale, Encana and Apache are using a high flow capacity saltwater zone (the Debolt) located above the Horn River as a secondary fluid source. In fact, we are now fracturing Horn River wells with saltwater from the Debolt. Operators are looking for similar zones in other areas, especially in more arid regions. Artificial lift also must be considered in designing well completions for liquids-rich shales. In some cases, artificial lift can be necessary from the first day of production. Obviously, completions in the Barnett and Eagle Ford–both of which produce 38-40 degree API gravity crude oil–need to accommodate artificial lift equipment. But even a multicomponent wet gas mixture can have liquids that condense in the well and require pumps and tubulars. For instance, in the Granite Wash, where liquids are produced as condensate, artificial lift may not be required initially, but it becomes necessary as reservoir pressure declines. Almost 95 percent of all oil wells in conventional reservoirs are on some form of artificial lift, and that percentage could ultimately be even higher in oil shales. Once flush oil from reservoir voids is produced, flow rates decline very rapidly, and the operator is soon left with a large, interconnected fracture system with reduced reservoir pressure. Artificial lift increases the ability for the liquids to flow to the surface and assists in draining oil through fractures connected to parts of the reservoir outside the near-well-bore area. Beam pumps, gas lift, electric submersible pumps, plunger lift, jet pumps and progressing cavity pumps all could find applications in producing liquids in horizontal shale wells. Technologically speaking, however, the industry remains challenged for a good system capable of lifting both liquids and gases in horizontal wells. While beam pumping is the most efficient lift method, it also is most susceptible to gas locking in highly deviated wells. The action of the rods working inside the tubing also can create friction problems. There is clearly an opening for artificial lift companies to develop better systems for these long-lateral horizontal wells. One of the questions impacting lift system selection is whether to drill the lateral section “toe up” or “toe down.” Drilling toe down creates a sump that collects the liquids, but getting an artificial lift system to effectively move liquids from the lowest point of the well at the end of the lateral through the curve and up the vertical section is becoming increasingly more difficult as lateral lengths extend beyond 4,000-5,000 feet. Consequently, many operators are designing toe-up laterals, with the “belly” at the heel of the lateral near the kickoff point and the horizontal section angled upward 92-95 degrees. Although not as restrictive as the toe-down design, it still limits the type of lift system that can be used. Some types of pumps are disqualified by the high deviation angles as the well turns horizontal and angles upward toward total depth. Gas lift systems can be run fully horizontal and flow gas, but they begin to lose efficiency at about 20 degrees. To get enough turbulence to efficiently lift liquids, so much gas has to be pumped down hole that the friction begins to create back pressure (the way to increase production is to lower bottom-hole pressure, not increase it!). Beyond the need for artificial lift, liquids-rich shales are good candidates for refracs as well as enhanced oil recovery. Shales respond very well to refracs, achieving a much higher success rate than conventional reservoirs. On the EOR front, testing of both mechanical and chemical techniques is occurring in some shales. A good example is microemulsions that incorporate carbon dioxide. This is a relatively inexpensive chemical technology that could prove very beneficial, especially in formations that do not yield to pure mechanical solutions. The microemulsions clean oil from the rock and mobilize it. They can be applied either as flood treatments or as part of frac treatments. Initial laboratory test results on cores look very promising. Longer-term, I fully expect to see full-scale CO2 EOR projects in both oil and gas shale plays. The benefits of carbon dioxide flooding are well understood in oil reservoirs, but initial work in CO2 sequestration suggests that carbon dioxide molecules also can displace gas molecules absorbed on the rock. There can be substantial amounts of absorbed gas in place, and it is typically richer gas (ethanes, propanes and butanes). Absorbed gas is not typically produced with free gas because reservoir pressure simply cannot be reduced enough. The hydrocarbon content of the gas produced in shale plays supports this concept. Initially, shale wells produce gas very high in methane. Over time, methane concentration drops by a small percentage while ethane, propane and butane content increases. This is the absorbed gas coming off the rock as reservoir pressure declines. By displacing absorbed hydrocarbons, CO2 injection represents a potential EOR system to increase recovery rates, especially in deeper and higher-pressure reservoirs such as the Haynesville, Eagle Ford and Bakken. GEORGE E. KING is a global technology consultant at Apache Corporation with 40 years of industry experience. He began his career with Amoco Production Research. King also served as a petroleum engineering consultant and new technology advocate at BP Amoco, an adjunct professor of petroleum engineering at the University of Tulsa, senior vice president of engineering at Rimrock Energy LLC, and a consultant on completion, stimulation, intervention, shale well fracturing, and workovers. He is a former Society of Petroleum Engineers distinguished lecturer, and has served on numerous SPE committees and workshops. King is a recipient of the Amoco Vice President’s Award for technology, API Service Award, and SPE Production Operations Award. He holds a B.S. in chemistry from Oklahoma State University, and a B.S. in chemical engineering and an M.S. in petroleum engineering from the University of Tulsa.